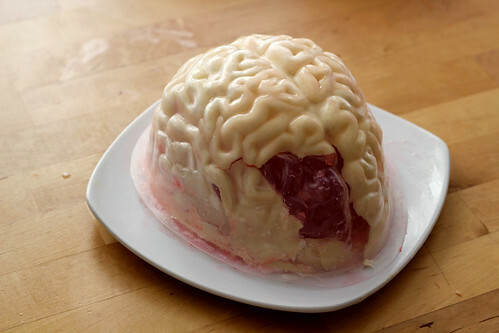 I bought a plastic brain-shaped mold at a grocery store in Solvang for $4.99. “What a tremendous deal,” I stupidly thought. “There are SO MANY occasions in which I find myself thinking, “if only this food were brain-shaped.”” Ok, I haven’t uttered those exact words, but I did see the mold as a gateway to new crafts and possibilities. I have exactly no experience with Jell-O molds beyond eating up their contents at family picnics and holiday work parties. My first attempt at mastering the mold was doomed from the start. I found Oreo Cookies and Cream pudding at my local market and had visions of serving up gray matter for dessert. As my husband so eloquently put it, “Megan, pudding is pudding. Not Jell-O” Why I thought a Jell-O product would work in a mold, I guess I’ll never know. But as many of you may have already realized, pudding, as my husband says, is in fact pudding. It never really hardens, or takes on the shape of anything. It is tasty, but also limp and sloppy, and stays that way in a mold. My next attempt at salvaging a Halloween dessert that would delight and horrify needed a hard shell to keep everything in place. While I don’t detest white chocolate like some people I know (I’m looking at you Jessica), I’m not really crazy about it either. For the perfect bone-colored exterior to my bright red and gelatinous brainy middle, I knew white chocolate was my guy. I proceeded to melt and pour and set and mix and stir until I thought I had the perfect recipe for what I was going to call Red Brains and Skull. The only problem was that the white chocolate broke when I tried to un-mold it. It broke over and over and over again. The red Jell-O center trembled with fear, or simply because it was Jell-O, as I stormed around the kitchen, glaring at my pile of fail. 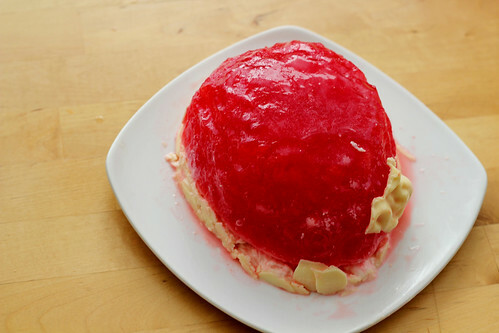 Oddly, the Cherry Jell-O interior did hold it’s shape during my little kitchen hissy-fit, and made me think that I could, and WOULD attempt molding deserts again. Perhaps there will be more non-stick spray or butter next time? Perhaps even Saran wrap? If any of you have had luck un-molding chocolate or even pudding(!! ), please feel free to share your tips with me as I am obviously not going to be invited to bring my brainy dessert to any picnics or parties at this rate. Chalk this one up to a swing and a miss. Happy almost Halloween anyway! Ha ha! White is the color of Satan’s chocolate! Anyway, I’m so glad you post your craft fails! I mess stuff up all the time, and I know all those craft bloggers out there do too, but they rarely share their failure. It’s nice to remember that everyone is human. I agree with Jessica. For once you let us not so crafty people feel like YOU ARE HUMAN. You create magic 99% of the time and I feel like I have a shot if 1% of the time it doesn’t go perfectly, Ms. Stewart! Why does it say “Sara and Jeff Eaker”? I am an independent woman! Ha. Thanks Jessica! I have a whole list of craft fails I haven’t posted yet. You want to know about burnt granola? Popcorn balls that refuse to be shaped into balls? Oh, and then there’s my website re-design.. they all make me appreciate the crafts that DO work. I guess. <3 Thanks for the encouragement girls! Perhaps you should make a brain-shaped rice krispy treat! I don’t even know if that’s feasible. 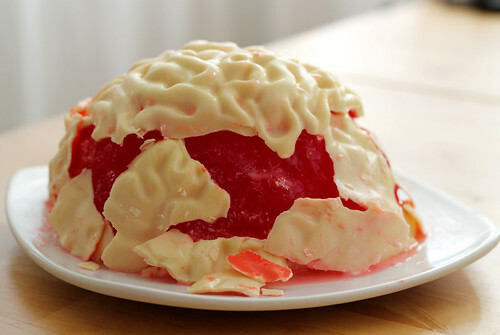 I like the red brain jell-o. mostly because i like jell-o. I see a zombie craft theme in here somewhere. Ahhh yes, this would be perfect for a zombie dinner. Well played madam. 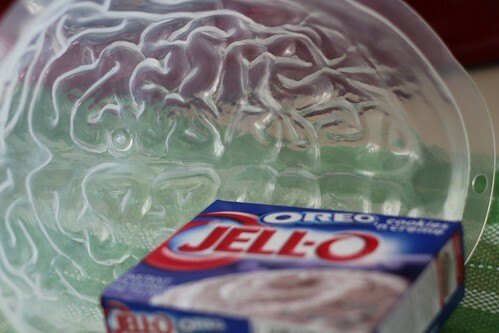 Perhaps you could just mold jello in the mold. Then purchase a plastic skull, slice off the top and make it like a lid. If you put the molded jello inside you could probably get the desired effect? Megan, you are crackin’ me up! I think you were brilliant to think of white chocolate, and the first picture looks very brainy! Thanks for your blog, you always make me smile and I feel like I’m not so far away. Thanks for the suggestions Krystall and Melissa. Stay tuned I will not be beaten by this $4.99 piece of plastic!